L'il Dee's Crafting with a Kitten: Wolves!!! Well I did get into my studio this week but I didn't actually get any class samples done yet. I did however manage to get a couple of cards made. I love wolves (however I am definitely a Team Edward person...when it comes to Twilight) and I needed to make a couple of more guy cards and this is what I came up with. 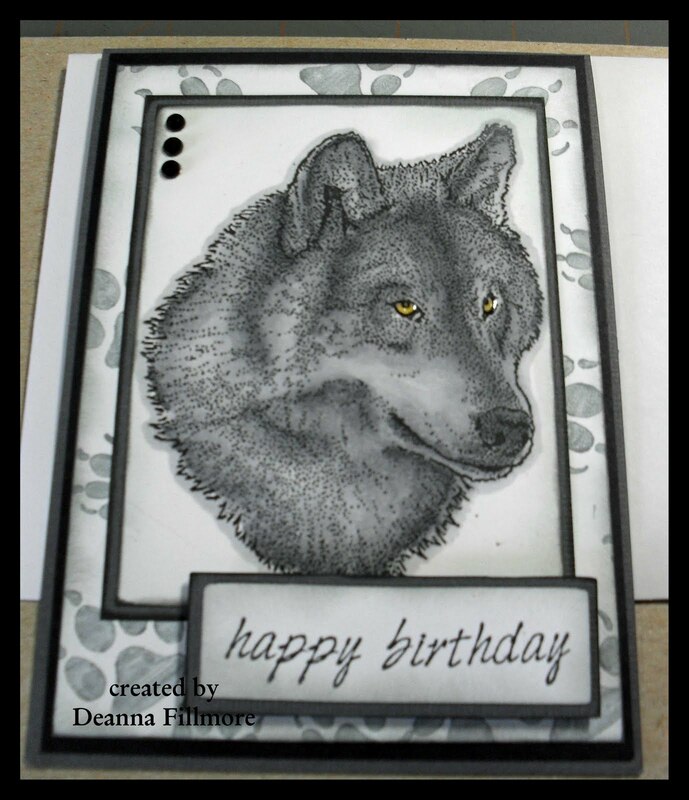 The wolf image for the first card is a digi image. I really don't know where I got this from, it was just a random digi in one of my digi folders. I colored it with copics (N1, N3, N5, Y21 & 0) and used a clear glaze pen on his eyes. The background paper is done using a wolf paw print stamp from Local King stamps and memento london fog ink. I used versa magic aspen mist & black ink for edging the papers. 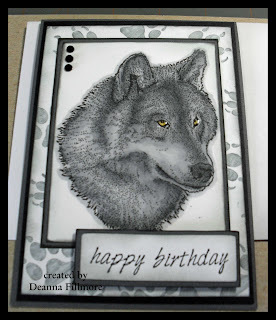 The wolf image for the second card is from the Local King stamp set "the wolf". I again colored it with copics (N1, N3, G40, G82, G85 & Y21). 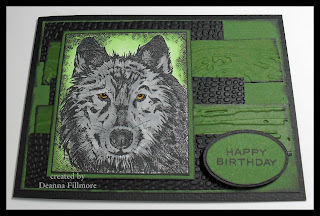 I embossed the strips of card stock using cuttlebug embossing folder mesh & Tim Holtz embossing folder wood grain. I guess I better get back to work so I can get those class samples ready. Thanks for stopping by and have a great week. Great guy cards! Love your coloring on both and the embossed pieces on the second!